Now that we have polar alignment optimized and our focuser working, the next step was the dreaded collimation. I have read all the posts about lasers and collimating scopes and was wondering how much this was all going to cost! Collimating a newtonian wasn’t that hard and I didn’t need the lasers for that, so I decided to at least try my old approach to this new optical set-up. First was the Cheshire sight tube which has been around forever and cost about $40. It consists of a peephole to be inserted into the focuser in place of the eyepiece. Through a lateral opening, ambient light falls on the brightly painted oblique back of the peephole. Images of this bright surface are reflected by the mirrors or lenses of the telescope and can thus be seen by a person peering through the hole. When I did this the alignment already looked as perfect as it could look with the eye as a judge. Now the next step is the one that is more controversial. My take on it is that once collimation “looks” as accurate as possible you are then ready for a star test. After all, that is ultimately what we are trying to accomplish isn’t it? Sharp round stars. Even laser collimation is a visual assessment and not quantitative. You need to base the final adjustments on stars and you need something to tell you how close you are or not. I never could understand the idea that you could conclude a perfect collimation based on an objective judgment of a diffraction ring pattern. This is why I have used a software based system for years that enables you to do the same tests we all did forever before the arrival of CCD technology where you look at a defocused star image and make adjustments based on your own visual judgment. The difference is you get an actual number in arc sec telling you how close you are or aren’t! CCDWare’s CCD Inspector software has a collimation function which I have found very useful. Now it isn’t the most inexpensive package around, but for less than $200 it provides many features beyond collimation which I use for imaging all the time and have done so for years. CCD Inspector works with MaximDL and also CCDSoft. Once you set up the program all you need to do is make sure it knows your image scale, then defocus a 2nd magnitude star image so it occupies at least around 200 pixel diameter. Finally be sure you have an efficient means of centering the star image. You open the “collimation viewer” and take a series of 3 images at a time, then observe the results. An arrow points to the direction you need to move the star image. Now you can take the edge of your hand to figure out where on your scope the arrow is pointing. I did that by holding my hand over the front of the scope while the images were being taken and then looking for the obvious defect in the image. The other key here was that Astronomics provided a vector diagram showing exactly what screws to turn to move the star image in which direction. It was then a simple matter to figure out what screws to use! 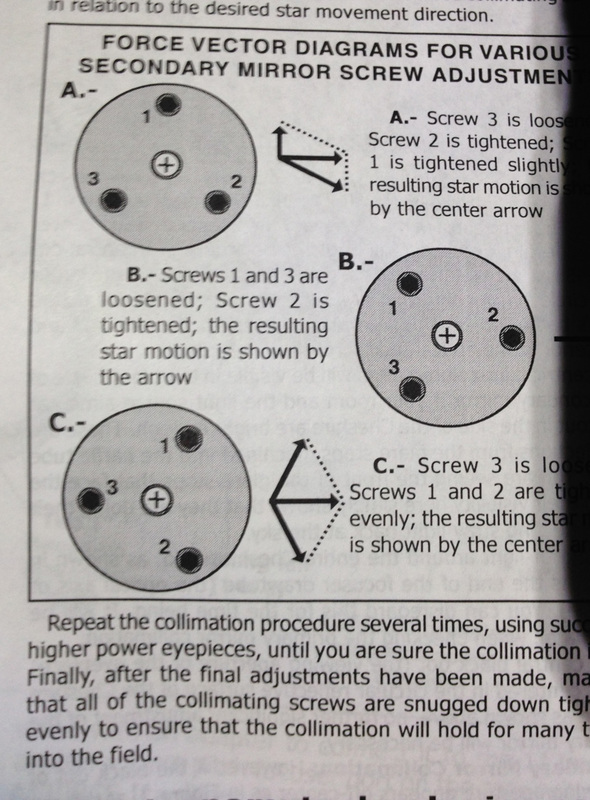 The following images and video show the steps used to fine tune the collimation as described above after using the Cheshire for the initial collimation step. *One very important thing esp for Astrotech users is that the secondary screws are extremely tight! You will need either a torque allen wrench or use another wrench to turn the allen wrench. You stop as soon as you see the screw move! The videos below show the collimation steps using CCDinspector and the vector diagram provided by Astronomics. You will have to turn up the volume as I was using my iPhone to take the video. Addendum 10/4/14; Since creating the tutorial I realized that I made a mistake! What you actually have to do on this instrument to make the proper correction is determine where on the scope the direction exactly 180 degrees opposite the arrow is. You take your hand and place it in front of the OTA like I have demonstrated here during a series of exposures, but you have to figure out the position directly OPPOSITE the arrow. Then you have to adjust the screws in THAT direction, not the direction of the arrow. But when you make that adjustment 180 degrees away from the arrow,the star image will move correctly in the direction of the arrow. That is STILL the goal. Sorry about the confusion! Thanks for reading and watching! Happy Holidays everyone!